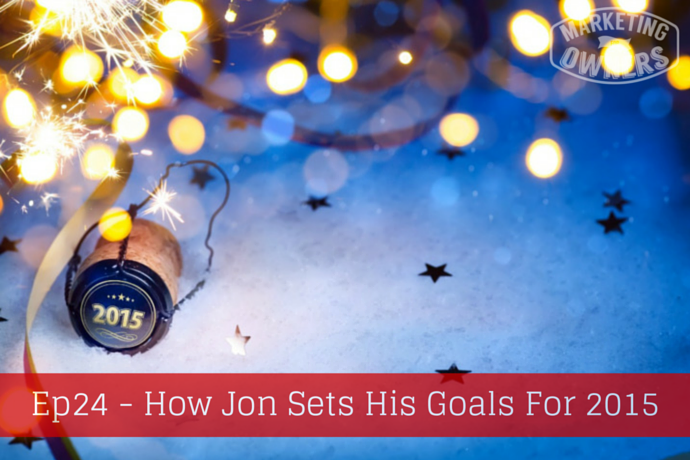 How Jon sets his goals for 2015. Yesterday, we discussed setting goals and how important they are and making sure you do not have too many… you are making them specific and time relevant and achieve the goal using SMART acronym. Now, I’m going to tell you how I go about it. I said before that I do not necessarily use January for setting them but I certainly review my goals every 90 days and January would be the start of a quarter. I have five goals, and not just five for the year, I have five goals for the year, five goals for three years, and five lifetime goals. And I will set five goals for the quarter, for 90 days but I start with five goals for the year. A lot of people would cover goals for personal life, for family life, relationships, spiritual, business, sport, health, physique, things like that. I personally prefer to set goals in relation to my family because being an entrepreneur, it is very difficult to get a work-life balance and to remember what is important and keep that straight. But I don’t write down goals for everything else because it will be too many but, generally, my business provides the income to achieve the things I want to do in my personal life. My goals will also include fitness and diet or eating and so on but they are more of a subset of the five goals. I start with the five yearly goals, now those need to be important. What matters to me is that those five goals will achieve something in my life. They will improve something. They will improve work – either my work becomes easier or my work becomes more profitable, more money in my pocket, money that can be spent on investing into the business and investing into having fun with my family, with my friends. My goals need to be achievable but not easy achievable. So what I mean by that is that, is there needs to be an aim, a goal, something I have to strive to achieve and put some effort to reach. Once I set the five for the year, I can then set my five goals for three years. Those three-year goals will be following on from the one-year goals. So, assuming I got these done in this year, I can carry on. They will be very major achievements, things that are going to be very, very important to me. Once I have set those, I will go on to set my lifetime goals. As you can expect, I already have my lifetime goals, so I already have my three-year goals. I have to make sure that my one-year goals are always be going to be relevant to those but I started off in that way. The lifetime goals are very specific to me, more general and it do not involve specific amounts of money or cars or things like that. They include my health. Don’t forget these are for your lifetime. I expect to live until I’m 98 (don’t ask me how I know that, lol). So, I am half way through my life. I got a long way to go and a lot to do and I want to be healthy. I want to be able to afford it. I want to be able to do whatever I want to do and so I set my goals based on that. Then I come back to the twelve months. To achieve the twelve-month goals, we need short sprints. So, I then set quarterly goals. I will have goals that run for 90 days. There will be five. The five quarterly goals will be relevant to reaching the one-year goals. They will be written down, all of these. At the end of 90 days, I will review and come up with another 90 days and then another 90 days and then the final push to get to the 12 months. Makes sense, doesn’t it? But with the 90 days, once I write down each goal, I will then write down the first actionable item and the relevance and what difference the goal, achieving the goal will make. So, I have a full understanding of each individual goal, the relevance, what it is for. The time-specific is obviously 90 days. Some, by the way, can be achieved in a couple of weeks but there are still going to be important towards getting the 12-month goals. Some people will also have a theme for the year or, maybe, a word. Some people have 30-day systems to get into goal setting. My favourite is Chalene Johnson’s 30-day Push Challenge. It’s free, completely online and it teaches you an easy system over 30 days. If you need to try goal setting for the first time, this is good. I have used that every year at least once a year for 3 years and I will probably do it again at some point next year along with my other systems. This is what works for me. I change it up every now and again, but this is the system that’s working for me now. I recommend you find a system, you stick to it, do not give up. This is a marathon not a sprint. Okay, today’s recommendation is a Drive Time Podcast and I am going to give a shout out to Pat Flynn. 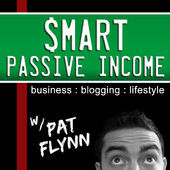 His podcast, if you look up on iTunes or on Stitcher, is called Smart Passive Income but look up Pat Flynn and you will be able to get to it. Pat is, in fact, has one of the most popular business podcasts on iTunes. Pat is very personable and easy to listen to. He has great guests, great information and he has learned from a standing start. He explains everything that he learns from the very beginners’ point of view and makes it very easy to understand, to apply. I recommend you go download it and get it on your iPhone, or on your Android. Listen to podcasts, people, please. Also, I will say I am going to give a shout out to our sponsors at New Rainmaker. Rainmaker is a platform that should be carrying your website as it does ours. Please look at what they do, consider it, look at the cost. It really isn’t a lot, in fact they are having a little, tiny price rise. But, even so, it is still not expensive. Keep an eye on it as they add new features all the time.